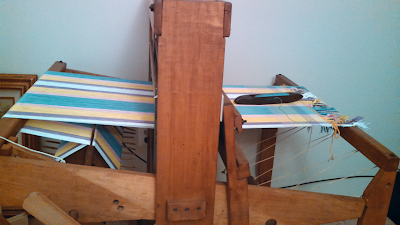 On the loom, with my lovely Kessenich shuttle. The loom is a Loomcraft Sabina from the '40s. I used 5/2 UKI perle cotton, sett at 16 epi (well, 32 for the doubleweave). The finished piece was 42"x48" off the loom; I didn't measure it after washing. As a side note, I like my Sabina. I think she gets a bad rap for being quirky (3/4" thick ratchet and pawl in the middle of the back beam? 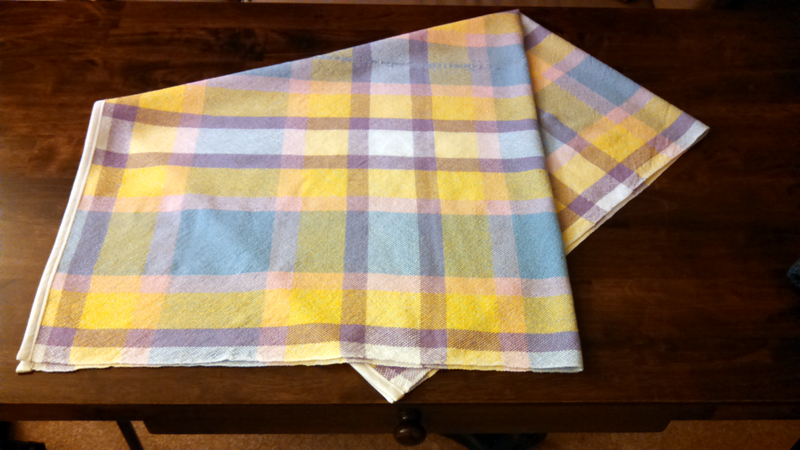 ), but she's solid and her quirks don't get in the way of weaving. 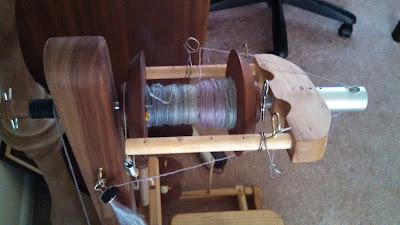 (Well, once you move the ratchet and pawl to the side, anyway...) I need to replace a couple of the rods that connect the treadles to the shafts, since they've warped and treadling can be difficult in some combinations, but isn't everyone a little warped by the time they turn 70? This is my progress on 3/4 oz of bamboo and merino roving that I got from MDSW. It spoke to me when I pulled it out of the bag this time; it said, "Make me a three-ply knitting yarn!" but it also said, "Keep my colors together!". Well, the only way I can reasonably do that is Navajo ply, but 1. this is a really fine and slippery merino/bamboo blend, so it isn't the strongest yarn, and 2. I hate Navajo ply. Instead, I'm opting to ply it with two strands of that nice soft brown-black alpaca I also got from MDSW; unless there winds up being too much brown in it, the darkness should let the colors in the merino blend shine nicely. The wheel is my Cassandra wheel, which I've modified to accommodate sliding flyer hooks and a cotton drive band. I would very much like to own a warping wheel or warping square. I have a sectional loom, so it would be pretty handy. However, I would not like spending $600 nearly as much. Think of all the yarn I could buy with that! So, as I do in such situations, I figured I ought to make one myself. I haven't entirely succeeded, but for approximately $60 in parts, a partial solution is great. 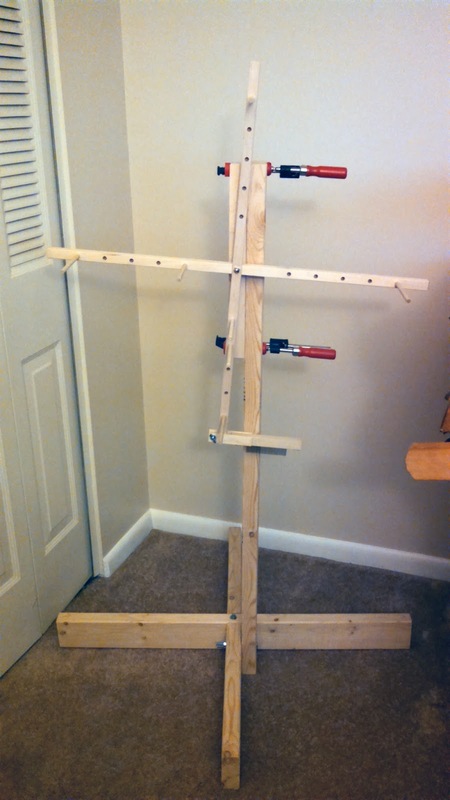 That's my 72" yarn swift from Fiber Artist Supply Co. clamped to a base made from bolts, nuts, and a chopped up 2x4. The swift comes with the wooden pegs, and is quite nicely made. I haven't used this very much yet; it has an absolute lack of tension control, so I can't wind directly on to my loom without the whole thing flopping all over and dumping all my warp on the floor. It's just fine for winding sections that I'll chain off and beam later, though! I still find it a lot faster than a warping board or reel. 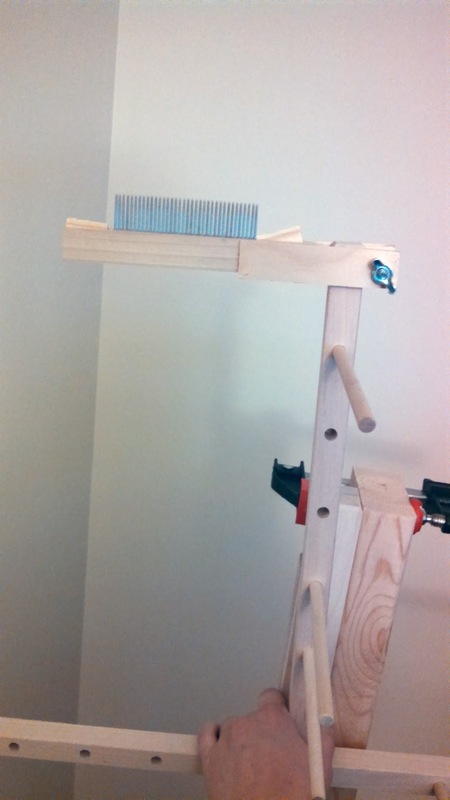 I will probably build a new wheel head to replace the swift at a later date, so that I can add tension control and a place to clamp the mini-raddle. I presently fly a purple Cobra in Elite Dangerous. This Christmas season I'll also be flying a purple Cobra on my tree. 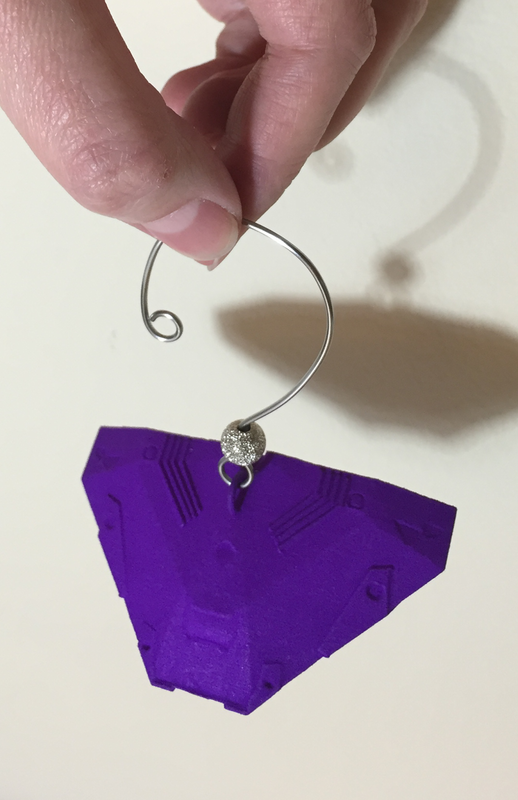 3D printed at Shapeways with this model from JotaErre, modified slightly to add a hanger loop. If I were you I'd move the loop further to the front to balance the model a bit better, but it's not bad as is. 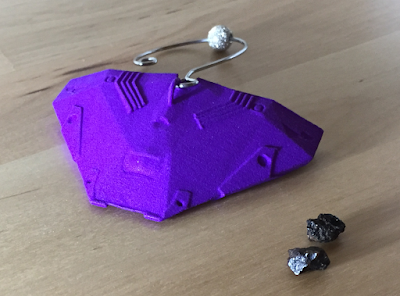 Bonus action shot: just unloaded some sweet, sweet painite (real painite included!). Now you can easily find out whether solar activity is happening, and how severe it is, so you can honestly say "I'm sorry, there are some really bad solar flares today. Come back tomorrow.". Enjoy. I've run into another book-printing project, so I thought I'd share the PoDoFo imposition script I used to generate a printable PDF. I was going to write an interesting blog post, but wound up creating a Github repository instead. Go check it out. If I'm stringing ~6mm pearls on a doubled strand, knotting between each pearl, probably 4*[finished length of strand] + 12". Scale that according to pearl width -- if I'm stringing pearls that are, say, 4mm wide, I'll add an additional 2*[finished length]*0.333... to account for the extra knots. This is for my own personal reference, but feel free to benefit from it. I'm probably not totally wrong.